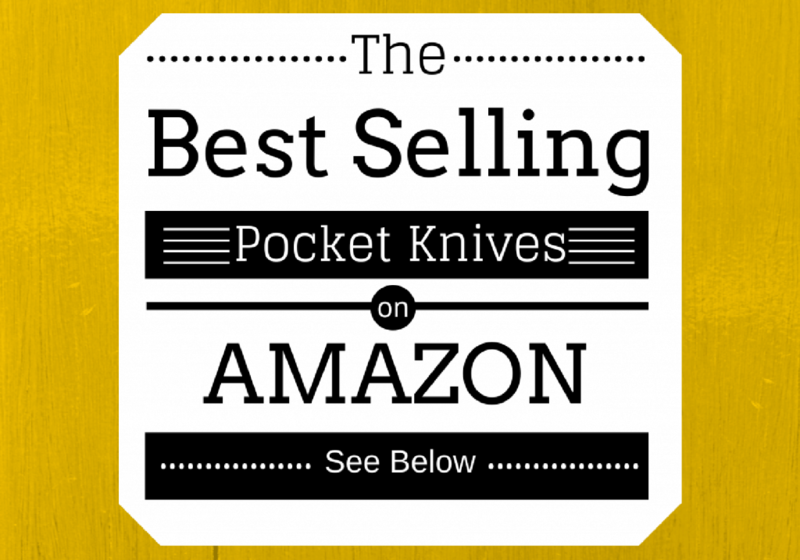 You are here: Home / Pocket Knife / What’s the Best Pocket Knife for Protection? 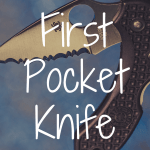 When you shop for a pocket knife, most often, you think of it as a tool. It’s what you reach for when you need to open a package. It’s what you use to cut the rats nest of fishing line as you break out your rods at the end of winter. But what about when you are walking home at night, and you can just make out the outline of a sinister figure approaching? What about when you find yourself stuck in the forest on what was supposed to be a day hike, and you see a large animal stalking you? These are fundamental issues about self-protection. 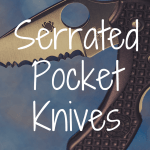 This article will help you select a pocket knife that will not let you down when you to protect yourself. 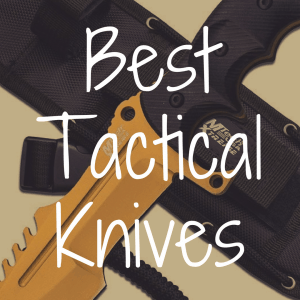 And, in order to better help you select the right blade, below, please view a variety of great knives that can also work for protecting yourself in a dangerous situation. If we’re going on sheer statistics, protection probably means self-defense against human attackers. Attacks by predatory wildlife, such as bears, cougars, and wolves, are exceedingly rare (sorry, Liam Neeson fans). In fact, the deadliest non-human animals are bees, wasps, and hornets, who kill an average of 58 people per year (strangely, cows are apparently also rather deadly, killing an average of 20 people per year). Motor vehicles kill an average of 33,000 people per year, to put this in perspective. However unlikely it may be, though, protection from human and non-human predators also means one is prepared to set up shelter in a survival situation. Therefore, it is a good decision to have access to effective self-defense knives. The decision to use a bladed weapon for self-preservation is not one that commonly arises these days. However, through the 19th Century, this was a more common concern worldwide. 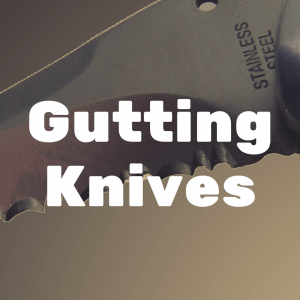 The knives created in response to these concerns then are still the right knives to use now. The Hissatsu’s design is derived from the design of the Samurai blades by James Williams, one of the core trainers of combat knife fighting for the US Army Special Forces. Williams’ samurai-inspired blade is perfect for the sort of slashing and penetrating stabs utilized in self-defense. Concerning materials used in the Hissatsu, its blade is made of AUS–8 steel, and its handle is made of glass-reinforced nylon. AUS–8 is a durable steel, although it will require more maintenance than a more expensive steel alloy. The glass-reinforced nylon handle is sturdy and non-slip, meaning that it will work well in all conditions. The design of the Hissatsu’s blade and handle are exceptional for a variety of offensive and defensive grips. The outward curve of the modified clip blade allows for smooth recovery when attempting to puncture or slash, as opposed to the inward curve of a karambit, which tends to act as a hook on tissue. While a more aggressive choil or quillion – those parts of a knife’s hilt that would protect the user’s hands when parrying a blow – would provide more defensive protection on the Hissatsu, it is virtually unheard of that a knife fight would include fencing-style blocks and parries. Whereas the Hissatsu was modeled after a Japanese samurai sword, the Benchmade Bedlam was modeled after the Arabian scimitar. This was not merely inspiration, though, as it was also homage to the jambiya, the curved sword utilized in Jordan, whose military commissioned the Bedlam. The Bedlam’s blade is made of 154CM steel alloy, a high-end steel alloy made with molybdenum that maintains its edge for a long period without being burdensome to sharpen. The Bedlam’s handle is made of G10 fiberglass composite designed for being strong under a variety of weather conditions. Benchmade’ scimitar-influenced design, with its sweeping curved blade and recurved handle, is well-balanced between offensive and defensive utility. Its jambiya-inspired blade shape (the knife was originally used by the personal security detail of a member of the Jordanian Royal Family) allows for parries and slashes, and the ergonomic hammer grip allows for devastating stabbing technique. The well-defined choil allows a large amount of latitude to utilize the blade for blocking or parrying without worrying about damaging the blade edge. While the Benchmade and CRKT knives took inspiration from weapons used centuries ago, the Gerber Applegate-Fairbairn takes inspiration from a more recent period of time: World War II. The Applegate-Fairbairn knife is a design variant of the Fairbairn-Sykes dagger that was originally used by the spies and commandos of the Office of Strategic Services (the OSS was the precursor to the Central Intelligence Agency) operating in Europe. COL Rex Applegate, its designer, was responsible for developing small arms and unarmed combat tactics for the OSS (which were also used by the US Marine Corps), modified the Fairbairn-Sykes Dagger to eliminate a design flaw that caused the tip to break. 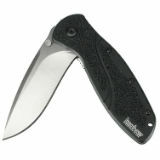 Applegate’s design was converted into a folding knife by Gerber, a brand I normally consider to be the McDonald’s of pocket knives. However, in the case of the Applegate-Fairbairn Covert, Gerber demonstrated it is capable of more than just passable quality. 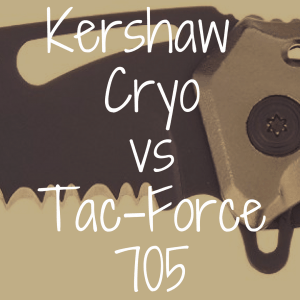 The blade on the automatic model (available to law enforcement and the military) is made of 154CM alloy, identical to that used by Benchmade, which is a strong alloy with good edge retention. The knife’s handle is made of the G10 fiberglass composite, also like the Benchmade, and it appears that Gerber has taken some design inspiration from Benchmade in the grip on the handle. What makes this knife work for protection is its ability to be used in hand-to-hand combat, as Applegate intended, but also be used for wilderness survival (for example, it could be lashed onto a stick for use as a spearhead). While Gerber advertises the automatic version of this knife as having a 154CM blade, it does not specify the blade materials for the civilian-available model of this knife, only stating that the blade is “titanium-coated” (it could be titanium-coated pig iron for all I know). Like the other knives reviewed here, the Spartan is reflective of earlier military heritage, in this case, the Nepalese Kukri, famous for its association with the Royal Gurkha Rifles, which, through its regimental history, is associated with some of the most dramatic infantry battles. The kukri’s design allows for its use as much like a hatchet and machete as it allows for its use as a knife, and Cold Steel has produced an amusing capabilities video demonstrating some bizarre uses for its Spartan Kukri (“Do you need to attack a garage door? Do you need to carve raw meat hanging from a rope? Then this is the knife for you”). While other knives are made with steel alloys from Japan, Cold Steel utilizes a US-based BDS1 alloy steel that was specifically designed for knives. Based on the information provided by the alloy’s manufacturer, Carpenter Technology, it appears that BDS1 steel is comparable to 440C steel. If so, then this is sturdy knife material, with decent edge retention that is not overly burdensome to sharpen. The handle is made of injection-molded plastics, which is generally easier to grasp than a steel handle and more durable than a bone or wood handle, but less durable than nylon or fiberglass composite handles. What makes the kukri in general – and the Spartan in particular – so effective as a protective wilderness survival knife is that it uses a forward curve much in the same way as a hatchet. 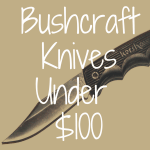 This allows for incredible force to be used with the knife, whether in cutting through brush or fending off an attack. 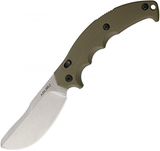 Of the reviewed protection knives, the Aruru, with its broad 4.5-inch blade and 10.5oz weight, might be the biggest and heaviest. This heft works to serve the design of the knife, however. The Aruru is based on the Malaysian parang, a traditional bushcraft tool that was used much in the same way as the kukri, machete, or hatchet. With a curved blade and recurved handle, the Aruru can be held at the back end of the handle for chopping or swinging strokes that rely on inertia and force, or choked up and grasped just below the blade for detailed cutting and stabbing. Fox, a subsidiary of Böker, did not skimp when it came to the quantity or the quality of the materials. Their interpretation of the parang is a 0.7-pound juggernaut; no other knife on this list weighs over half a pound. If nothing else, a heavy knife is a deadly knife. However, Fox has not skimped on the quality of the blade or handle materials and properly maintained, the N690Co alloy is comparable to 440C steel on the Rockwell Hardness Scale. It is not as hard as 154CM (used by Benchmade), but it will be easier to sharpen. 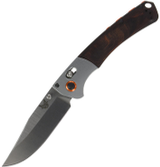 Fox also used G10 composite for the handle, perfect for rough weather or humid conditions. The Aruru is a jungle weapon; a fantastic update on the Malay parang.